Natural Channel Design (NCD) is an approach to watercourse restoration and realignment which attempts to reconstruct channels to emulate the natural physical form of the river or stream that would be appropriate for that location. In theory, the result should be a channel that is in balance with the natural process of erosion and deposition in the watercourse so that the ecological functions of the watercourse, which depend on these processes, can be maintained or restored. The practice of NCD has enjoyed increasing popularity over the past fifteen years in Ontario and elsewhere. 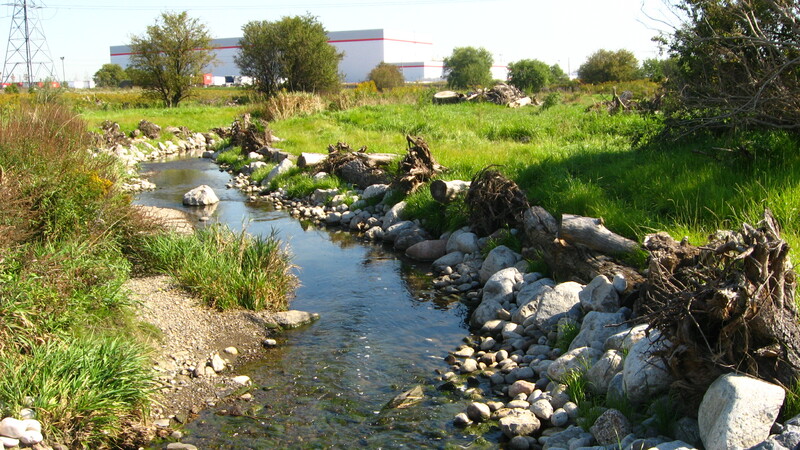 In the Greater Toronto Area alone, there are dozens of completed or approved NCD projects, and hundreds of kilometres of river and stream channels which have been identified for future restoration using NCD techniques. Unfortunately, there are no established standards in Ontario or elsewhere for the application of NCD and the design methods used vary widely from one practitioner and jurisdiction to the next. To help improve and advance the practice of NCD, Toronto and Region Conservation Authority (TRCA) has initiated a program to catalogue, monitor, and evaluate natural channel realignment projects within the Greater Toronto Area. Results of the program will help to identify techniques and approaches that are appropriate to Southern Ontario conditions. A standard monitoring protocol has been developed for application to new NCD projects to ensure that monitoring programs implemented on NCD projects are comprehensive, useful, and defensible. Two reports documenting the 2005 initiation of the project, including an inventory of NCD sites in the TRCA jurisdiction and the monitoring protocol developed for this program were completed in February 2009. See ‘Downloads’ on the right side bar for both reports in PDF format. Australian Cooperative Research Centre for Catchment Hydrology and Australian Land and Water Resources Research and Development Corporation, 2000.